MVIO, the Samsung-backed fashion authority of Seoul Fashion Week, launched its Autumn Winter collection in South Korea on Wednesday around midday. Moving on from last season's preppy dandy look, Han took a more modern approach to his grey-dominated tailorong. Aprons went with most looks, adding to the exisiting coats, jackets and tops as an extension of the the garment. Except for grey, we saw black and white pieces before MVIO moved into more colourful areas of khaki green, navy blue and brown shades on bomber jackets, cargo trousers, gilets and duffel coats. Felt backpacks, an exquisite shearling apron and raspberry red trousers made this collection an absolute highlight of the week. Sensitive but unusual colour combos (pink shirt, beige suit and a red apron) and the addition of models with prolonged mannequin torsos made this a show with equal amounts oversized showpieces and skilfully crafted wardrobe staple pieces. Dazed Digital: What's the name of this collection? DD: What's the fundamental idea behind it? Sang Hyuk Han: It's the Korean translation of the word 'complex' which means that you want to hide certain body parts that you are not happy with. DD: Is that were the aprons come in? 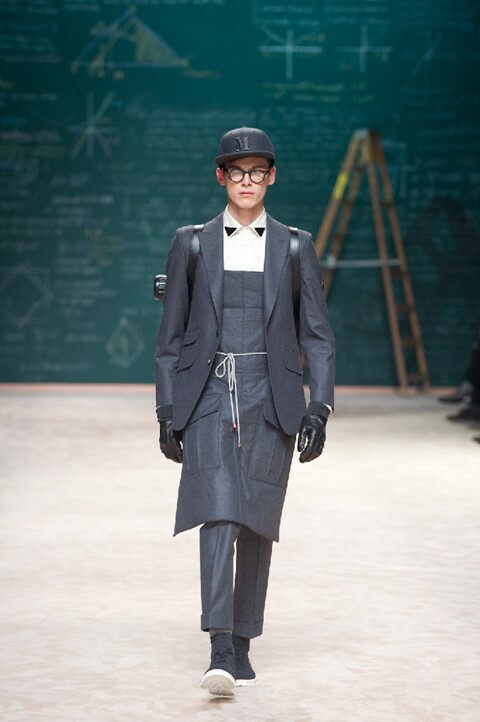 Sang Hyuk Han: Yes, I used the aprons and the oversized pieces as a way of hiding behind. Sang Hyuk Han: I really like the mannequin pieces that totally cover the upperbody and faces of the models!